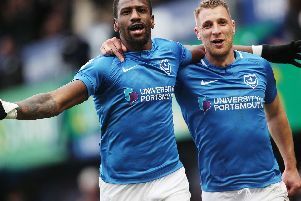 Pam Wilkins and Johnny Moore cast their eyes over Pompey’s trip to Mansfield Town. STADIUM: One Call Stadium, Quarry Lane, Mansfield, NG18 5DA. Redeveloped in 2000, the Stags’ stadium was formerly known as Field Mill and has been used as a football ground since 1861, making it the oldest in the football league. Pompey fans will be in the North Stand. DIRECTIONS: Leave the M1 at junction 28 and take the A38 to Mansfield. After passing the Kings Mill Hospital on your left and the Nell Gwyn pub on your right, turn right at the traffic lights into Sheepbridge Lane. After passing under a railway bridge, you will reach a set of traffic lights where you turn left into Quarry Lane. The stadium is on your left. PARKING: There is a small car park at the ground, with spaces sold on a first come, first served basis costing £5 per car. Please be warned that in the retail park behind the away end parking is limited to two hours – match day parking is not allowed. The parking is monitored by cameras and anyone leaving their car there for the match is likely to receive a ticket. There is also some parking at the station car park, for which there is a charge, and street parking in the surrounding area. NEAREST TRAIN STATION: Trains run hourly from London St Pancras to Mansfield with a change at Nottingham. The journey from London takes about two-and-a-half hours. There are reported engineering works on London underground. The One Call Stadium can be seen from Mansfield Station and is a five-minute walk. Leave the station via the footbridge, adjacent to platform two. Walk past Burger King, through the retail park and you will arrive at the North Stand. WHERE TO EAT AND DRINK: Driving in to Mansfield along the A38 you will pass several pubs. The Sir John Cockle, Sutton Road NG18 5EU is a large pub which serves food and has screens showing football. The Nell Gwyn at 117 Sutton Road NG18 5EX is smaller and just off the A38. There is also the Bold Forester, Botany Avenue NG18 5NG, which is part of the Hungry Horse chain, serving real ale and pub grub. Near the station is the Midland Hotel, Station Road NG18 1LP. There is also a Wetherspoons in town, called The Court House. The address is Market Place, NG18 1HX and it serves the usual food and drinks. Be warned, though, many of the pubs in town do not admit away fans. PREVIOUS MEETINGS: Pompey’s last two visits to Mansfield have resulted in a draw and a win respectively. Last season, a penalty by Matt Tubbs and a second-half goal from Jed Wallace earned a 2-1 victory against a Stags outfit down to 10 men for all but two minutes of the game. The previous season, Andy Barcham and David Connolly hit first-half goals in a 2-2 draw.